This workshop is becoming increasingly popular and I’m not surprised because each time I run it students walk away with fabulous new garments. Yesterday’s workshop was no exception and two of my students even went home in their creations! Here are from left to right; Louise in her straight neck vest in a lovely lightweight loopback sweatshirt fabric from The Cloth House in London, Debbie in her fabulous straight neck dress (which has a plain black back to it!) in lightweight jersey from Fabricland and Katie in another lovely straight neck vest in a teal ponte roma from Fabricland (loving that colour!). 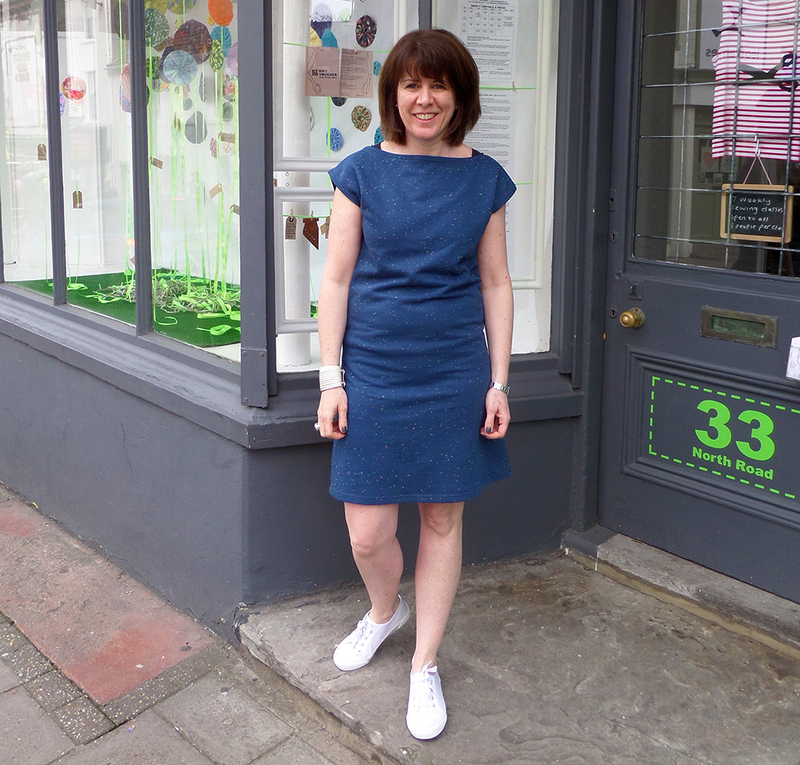 And here’s the same pattern and Louise again in a lovely sporty straight neck dress for summer using a gorgeous flecked teal sweatshirt fabric, again from The Cloth House. Last but not least is Kate in a lovely cowl neck dress in the perfect drapey printed jersey from John Lewis. This pattern will be the next one available as a multi-sized MIY Collection pattern, just as soon as I’ve finished my sewing book! 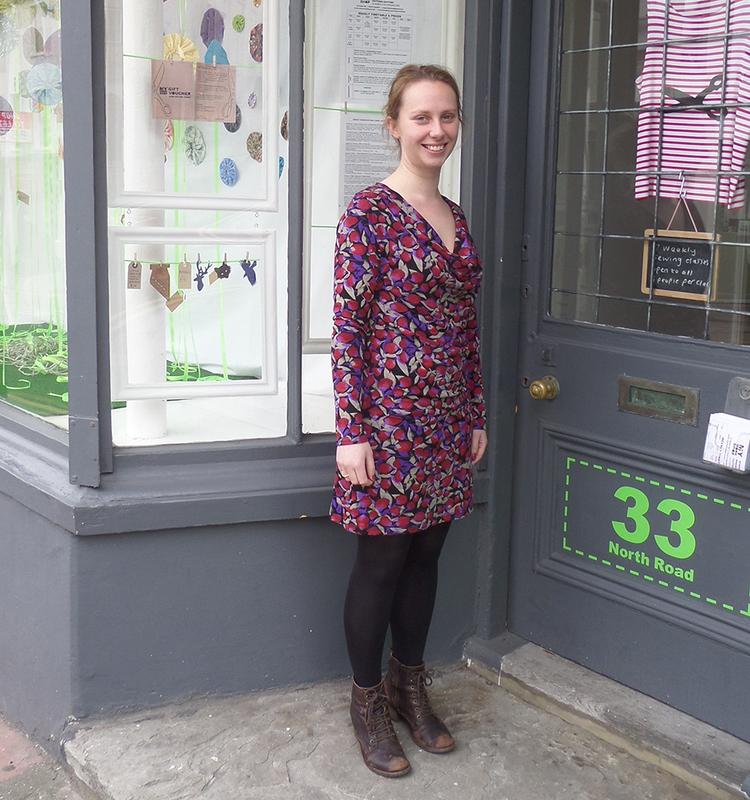 Impressively, once Kate had finished this dress, she then cut out and almost finished a shrug! The only person we didn’t get in front of the camera was Tess. She was soooo close to finishing a drapey cardi, but the sewing gods were against her – we had to really juggle the pattern and fabric to get it out of not quite enough fabric and then her bobbin ran out right at the end. You know how it always does, just when you think you’ve nearly done…?! Wow, thanks folks! Sounds like a job well done. If you’re feeling tempted to have a go yourself, I will be announcing more dates for this workshop soon. To be able to book your place before workshops are advertised (and they often book up before I get chance to advertise them on my website), join my mailing list here. Look forward to seeing you…..! As promised in my post on sewing seams in knits using a domestic sewing machine, here’s some tips on getting nice neat hems on your knits, all with the use of your sewing machine! As with seams in knits, you need to choose a way of hemming your knit garment that will stretch. 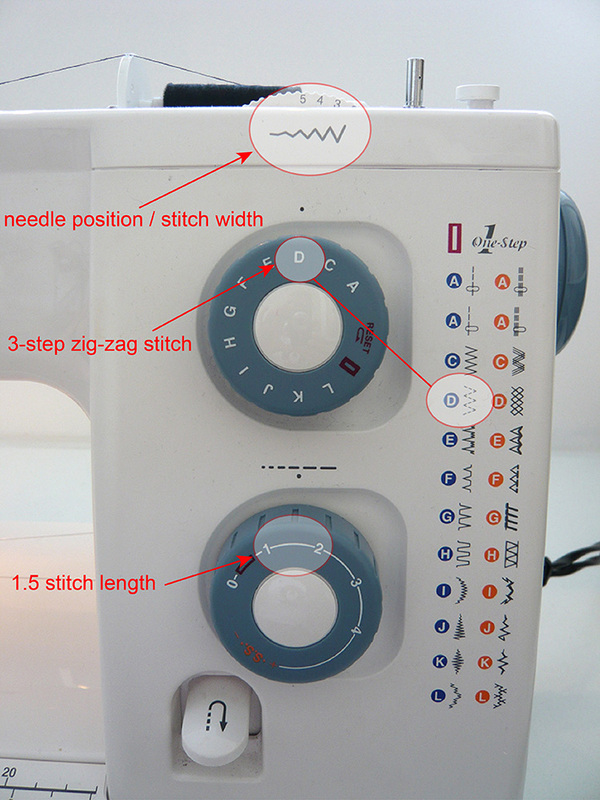 I’m going to show you my two favourite ways to hem knit fabrics on a sewing machine. 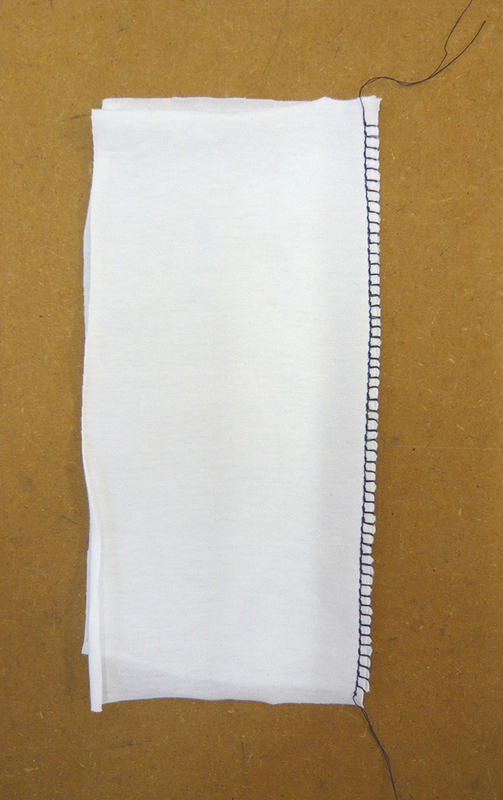 On the right side of the garment you will have a line of zig-zag stitches. Try to get the stitches just covering the cut edge of your fabric on the wrong side of the garment. 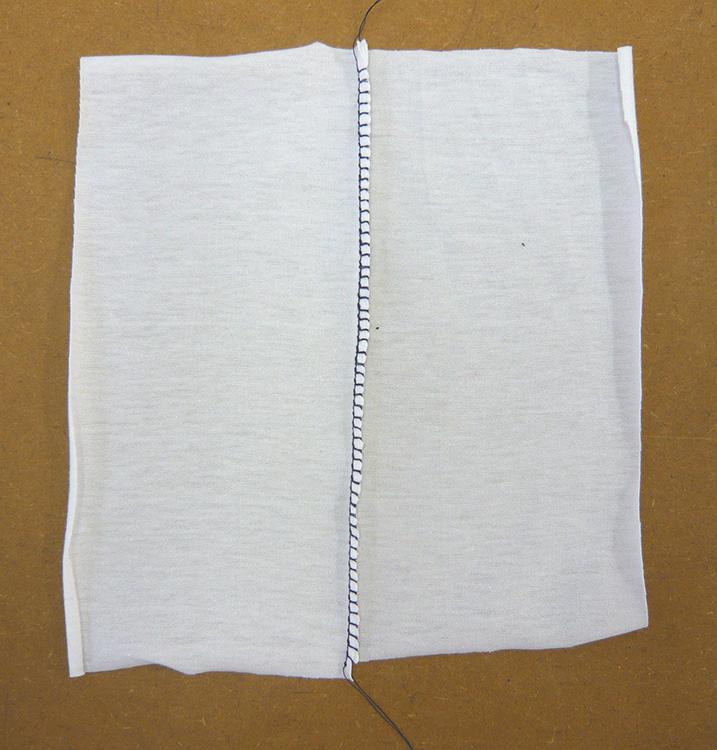 The second way of hemming a knit fabric, is one that most looks like the hems on shop bought knit garments that are finished with a coverstitch (a completely separate machine a bit like an overlocker). 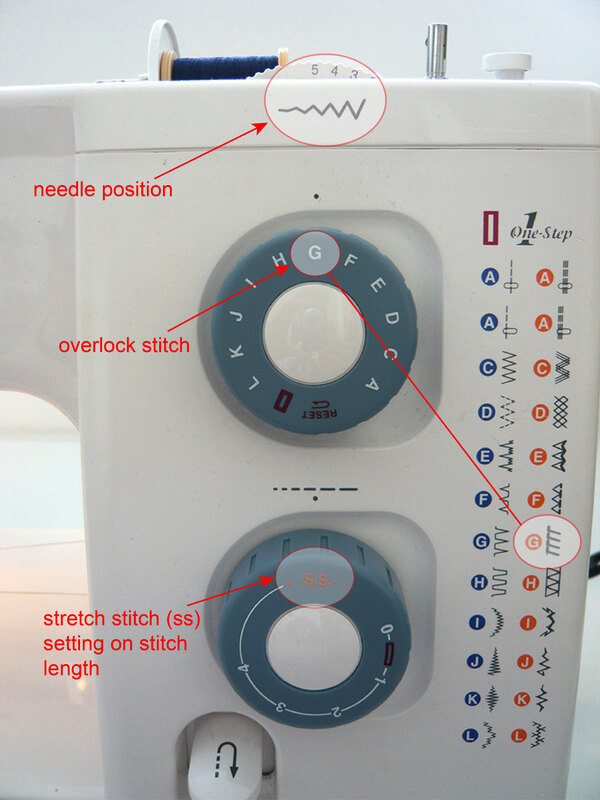 Rather than rush out and buy a coverstitch machine try a bit of twin-needling on your sewing machine! Twin needles are easily available and you can even get ballpoint twin needles – perfect for sewing knit fabrics without causing snags. 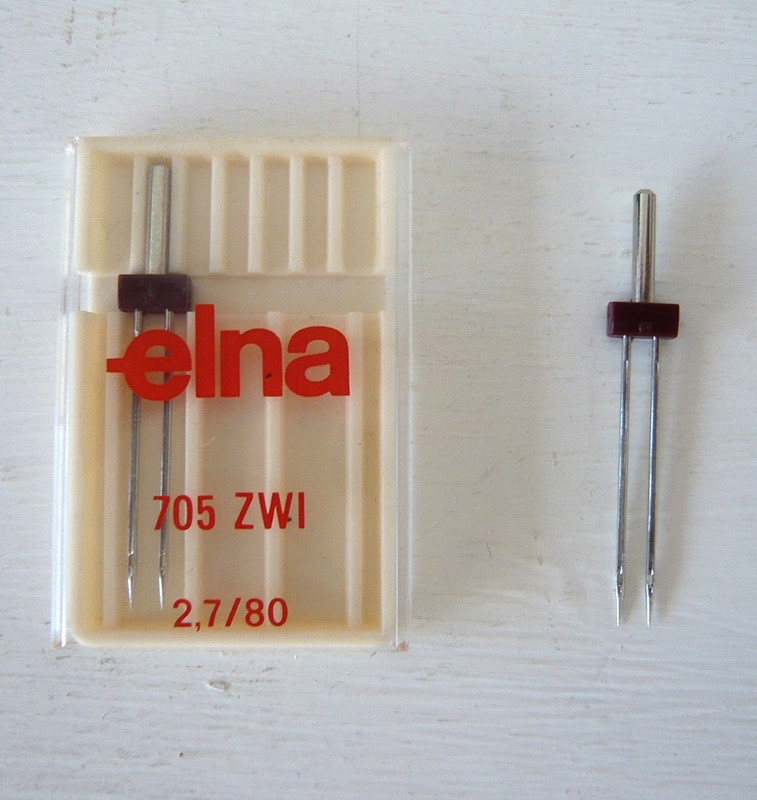 Most good sewing shops will sell twin needles and there is even a choice of what size gap you have between the needles. 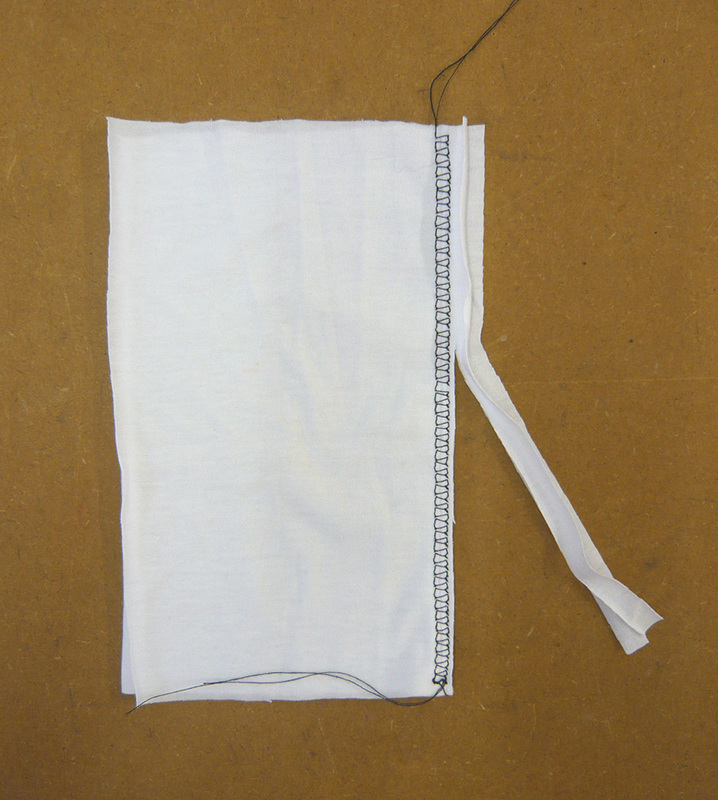 Then, sew as normal, but you must sew your hem from the right side of your garment so it’s a good idea to have your hem tacked first, then you can use your tacking stitches as a guide for your twin-needling to ensure you catch the hem on the wrong side. 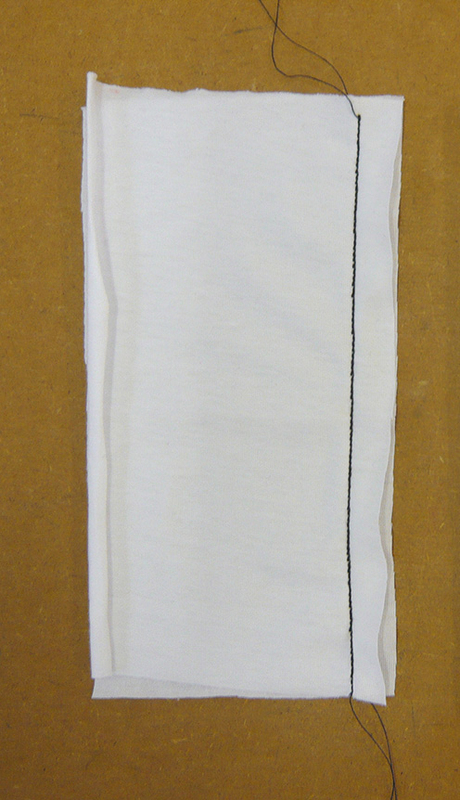 Here’s what your twin-needled hem will look like from the right side. Pretty professional no?! And on the wrong side, the bobbin thread forms a sort of neat little zig-zag stitch. 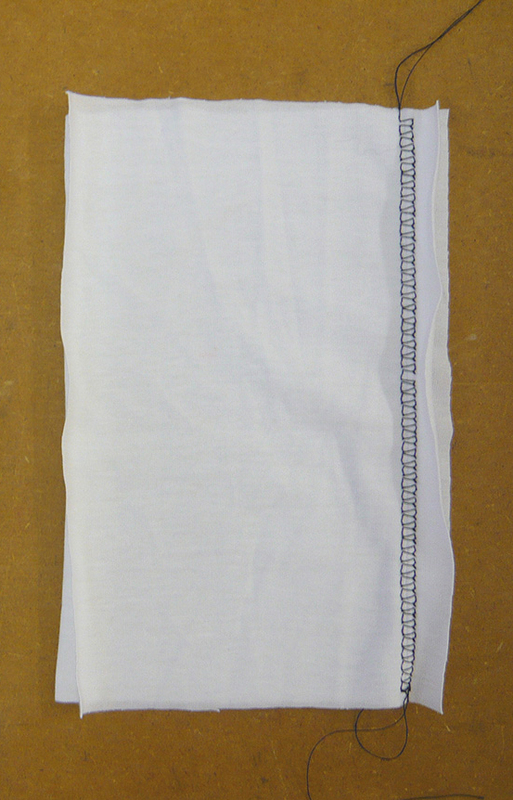 If you position your stitching accurately, the stitches should just cover the cut edge of your hem on the inside of the garment as shown above. It takes a bit of practice to get it that precise, but tacking your hem first helps! As with seams, the tension needs to be correct for the type of knit you’re sewing, but most lighter weight knit fabrics eg. t-shirt jersey and lighter need a looser tension of around 3. 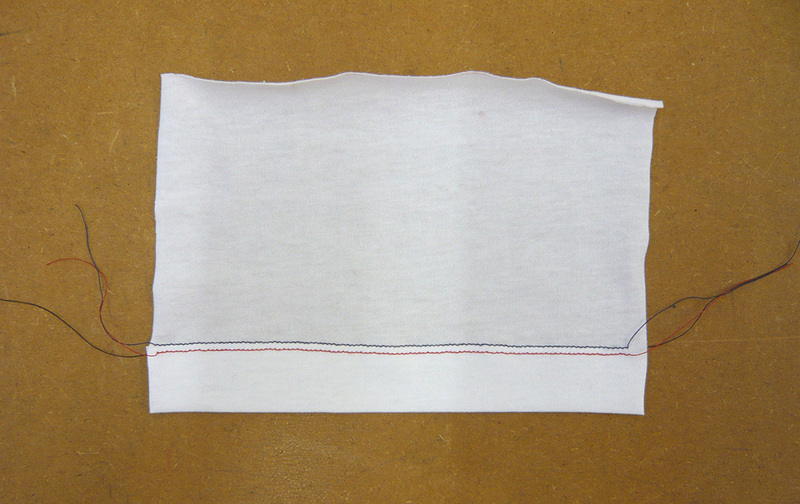 Depending on your fabric and your machine, you might find your hemmed edge going a bit wavy. First make sure you’re not stretching the fabric as you’re sewing! If you’re being good and not stretching your fabric (well done! ), then if your sewing machine has the facility to, adjust the presser foot pressure and this should solve the problem. Read more about adjusting the preset foot pressurehere. 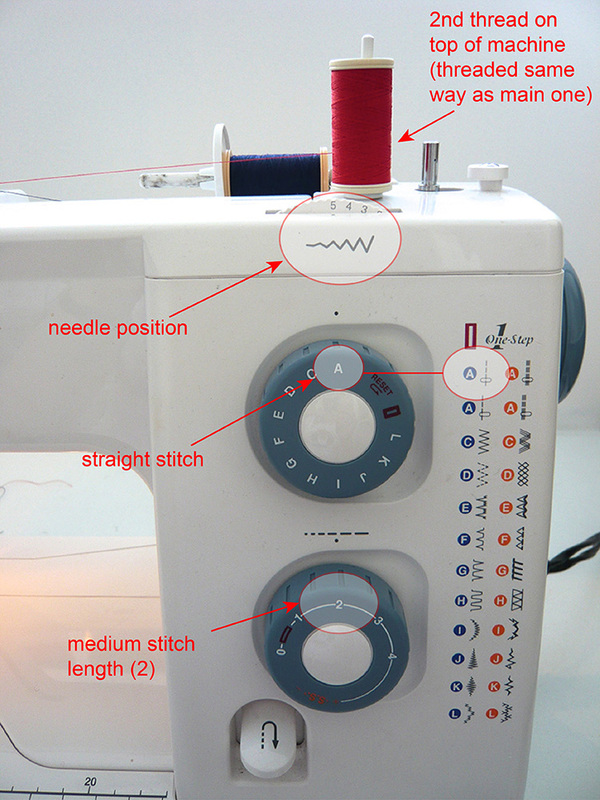 So, there you go, you now know how to sew seams and hems on your sewing machine so that they look neat and professional without the aid of an overlocker or coverstitch machine. Enjoy sewing those lovely knit fabrics, you’ll wonder why you ever avoided them, I promise. 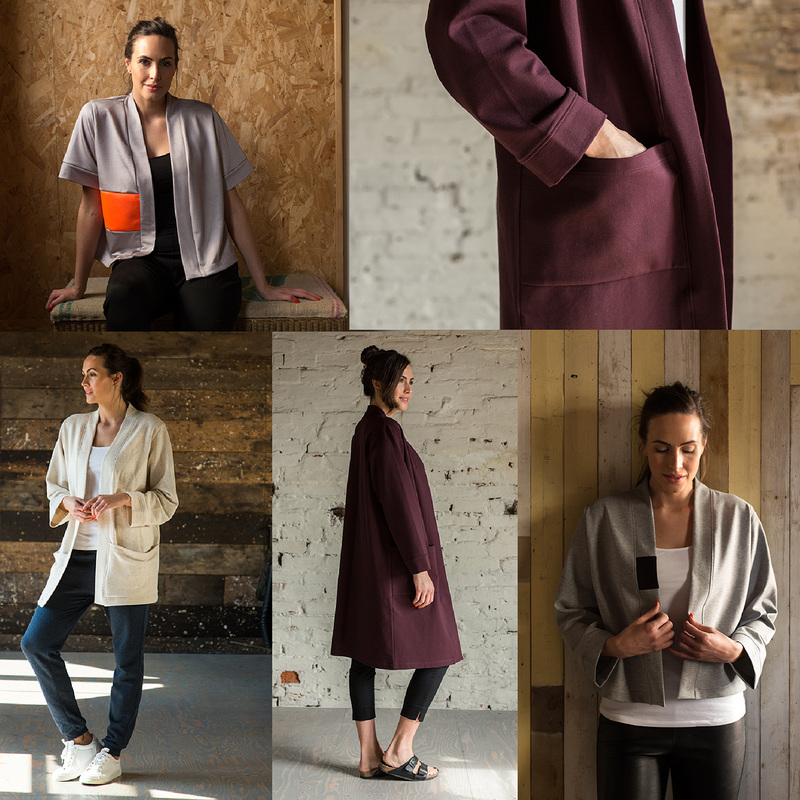 If you need some help finding nice knitted fabrics have a read of my guide here and my range of sewing patterns (most of which are designed for knit fabrics and are very easy to use!) are available to buy online here. Many sewers both new and experienced are unnecessarily scared of sewing stretch knit fabrics. I don’t want to make really tight figure hugging clothes. No, you don’t need to have an overlocker to sew knit fabrics. You can and an overlocker will make the job quicker, easier and neater, but if you’ve never used an overlocker before, definitely don’t start on one with a knit fabric! 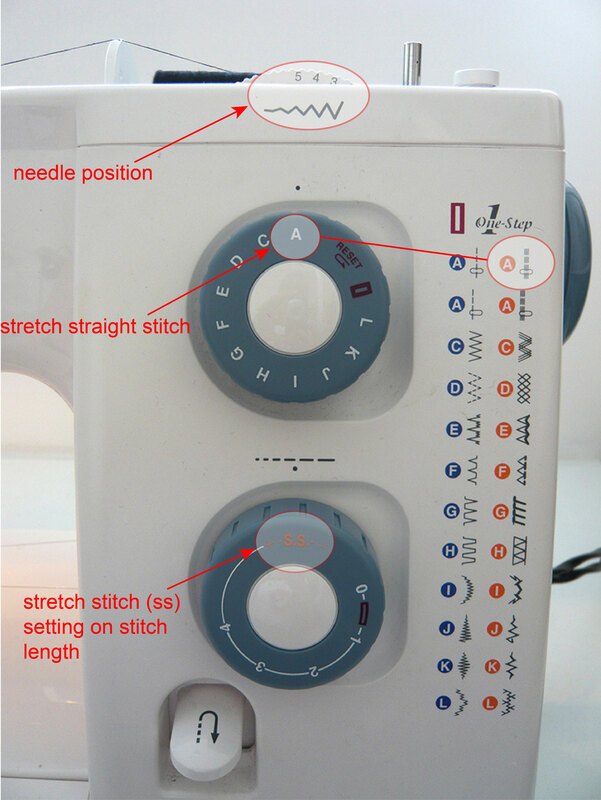 All reasonably modern sewing machines have a selection of stitches specifically designed for stretch knit fabrics. I’m going to show you the best ones for joining seams in this article. Even if your machine only does straight stitch and zig-zag a narrow zig-zag stitch will do the job. Some knit fabrics can be a bit more difficult to handle than a standard woven fabric, especially the lighter weight ones, but even a lightweight jersey isn’t going to be as difficult as a slippery lightweight silk. A few more pins when cutting out and a bit of tacking when you might just have pinned are the only extra steps you’ll need. I’ve actually seen this recommended in some of the bigger commercial pattern brand’s pattern instructions. This is absolutely the last thing to do unless you’re after stretched wavy seams! When cutting stretch knits you need to make sure the fabric isn’t hanging off your table because it will stretch the fabric, resulting in pattern pieces that ping up a lot shorter once you’ve cut them out! If you don’t have room for the whole length of fabric on your table, pile it up over the back of a chair beside the table. Also use a few more pins than you might do normally to hold your pattern pieces accurately in place. Using a few weights (or tins of beans!) to hold your pattern in place while you pin it will also help. To match seams accurately pin them first and if necessary tack them. Also use the nature of the fabric to your advantage…..it stretches, which means it’s very forgiving if something doesn’t quite match perfectly and you can get away with a bit of stretching to fit (as long as that bit of stretch is spread out along the whole of the seam). Have a read of my previous blog post about where to buy stretch knit fabrics, the different types of stretch knit fabrics available and their uses – knit fabric is a broad category. 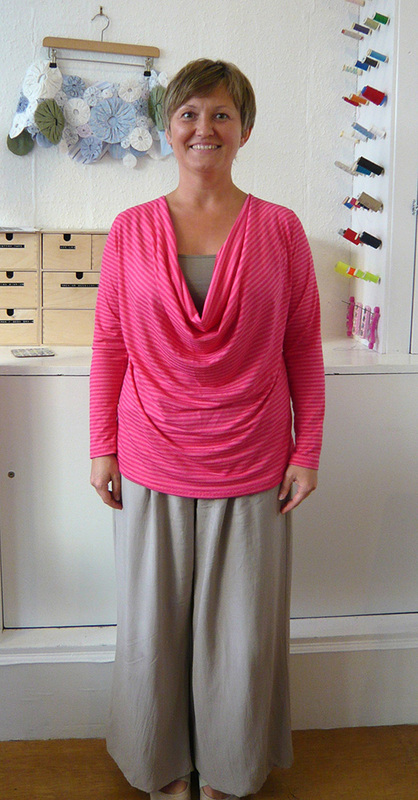 You can make some really flattering, draped styles using stretch knits. They’re not just for leotards and leggings! Think about the clothes you own that you enjoy wearing…..I’ll bet a lot of them are made from knit fabrics. So, hopefully I’ve made a start at converting you and you’re willing to have a try. The first thing I’ll show you is some stitches to use for seams. I’ll go through hems and finishing edges in separate posts. 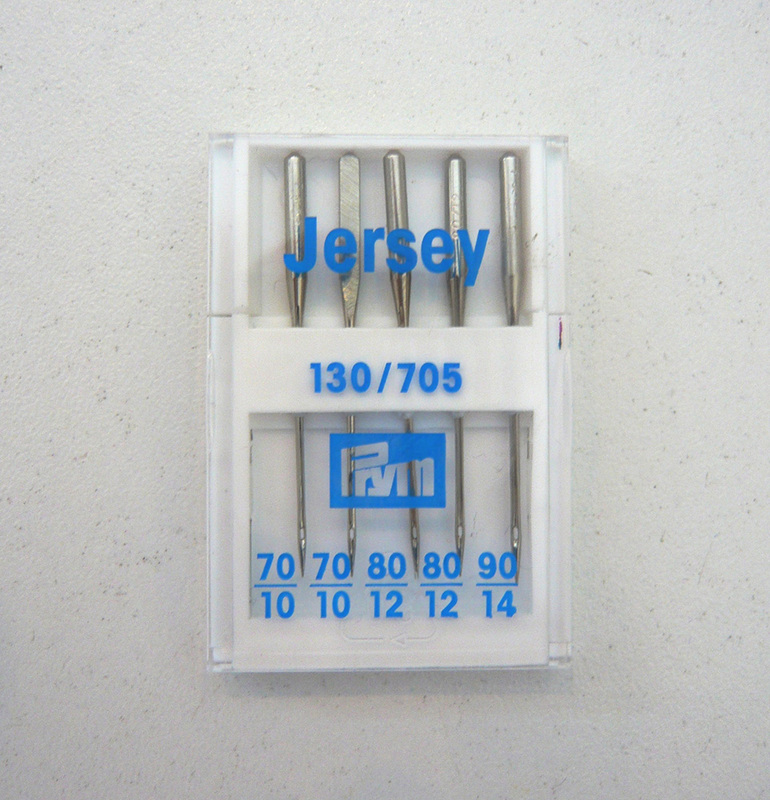 a pack of jersey or ballpoint needles. They’re a bit more blunt on the end than a regular sewing needle meaning that they won’t ladder the knitted structure of the fabric. You can see they also come in different sizes like regular sewing needles. 90 – interlock, ponte roma, some cut and sew knits. This stitch is useful when sewing with thicker knits whose edges don’t need any neatening and where you need to be able to press your seam open. 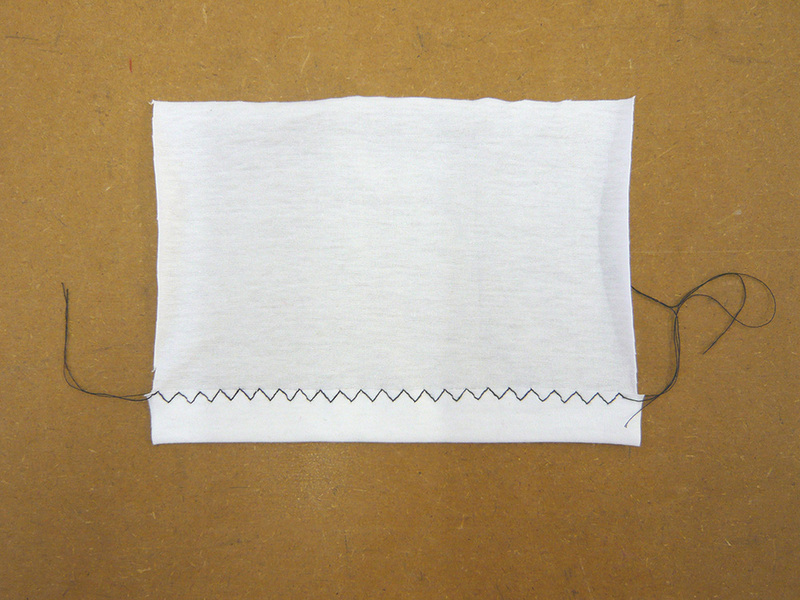 This stitch mimics an overlock stitch and can join the seam and neaten the edges in one go. 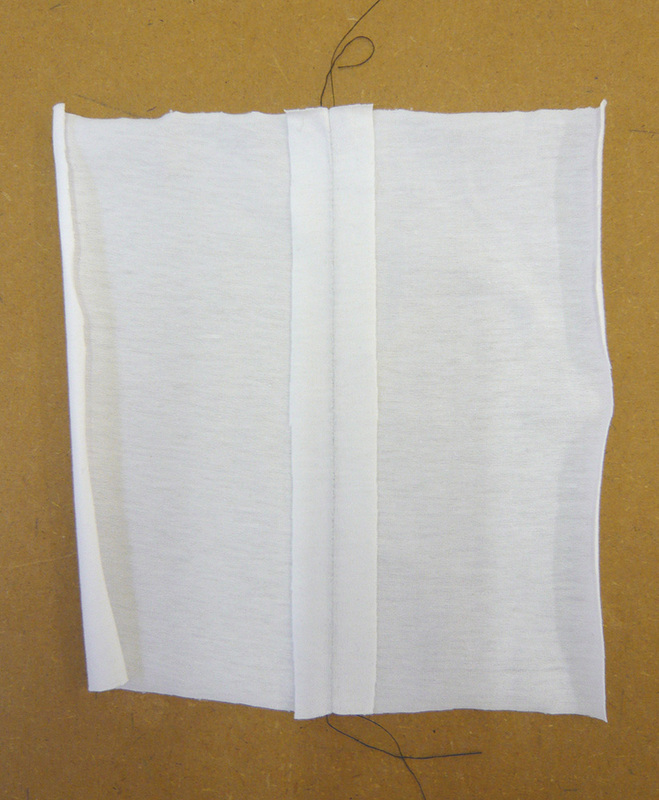 You can trim off the excess seam allowance close to the stitching as shown in the second picture. The seam then has to be pressed flat to one side rather than open, so it’s not suitable for more bulky fabrics. It works well on most t-shirt weight jerseys. 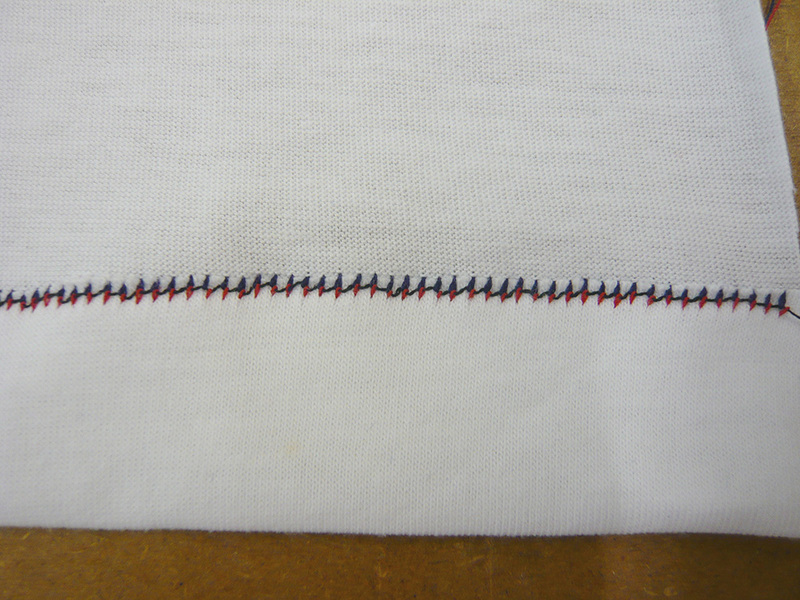 The final stitch for seams is the narrow overlock stitch used with an overcasting or overlock foot. (See this blog post for more about what an overcasting foot is and how to use it). Here’s the machine with the overcasting foot attached. This stitch again joins the seam and neatens the edge of the seam allowance in one go. By also using the overcasting foot it means you don’t need to then trim off the excess seam allowance after sewing. It also means though that you can only use it on narrow seam allowances (the overall width of the stitch). It’s another stitch that results in a seam that has to be pressed to one side and gives a nice neat finish to lightweight jersey fabrics. It’s not suited to heavier and thicker knits. If your sewing machine has the ability to adjust the presser foot pressure, this can be helpful when sewing some knit fabrics to stop them being stretched by the machine as you sew. You can read more about how to adjust the presser foot pressure in this blog post. 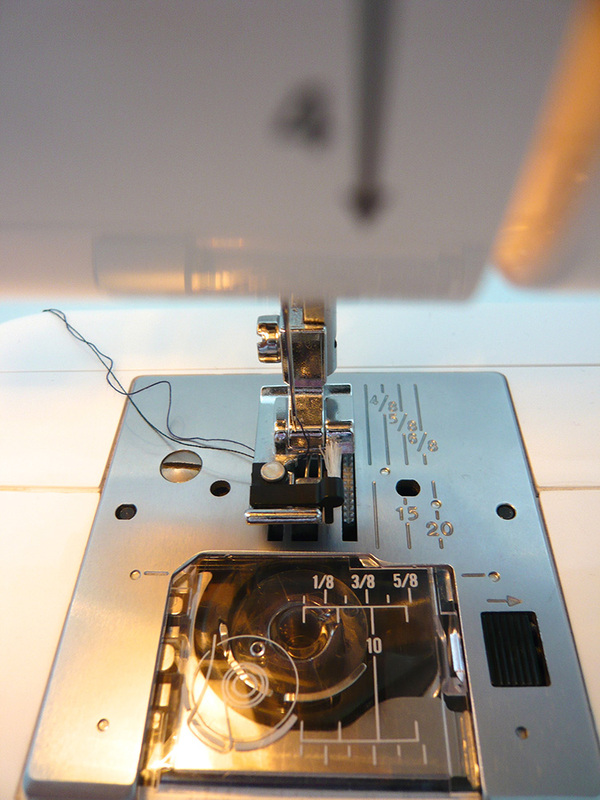 As with all sewing, make sure the tension on your machine is set at the right level for the fabric you’re sewing. 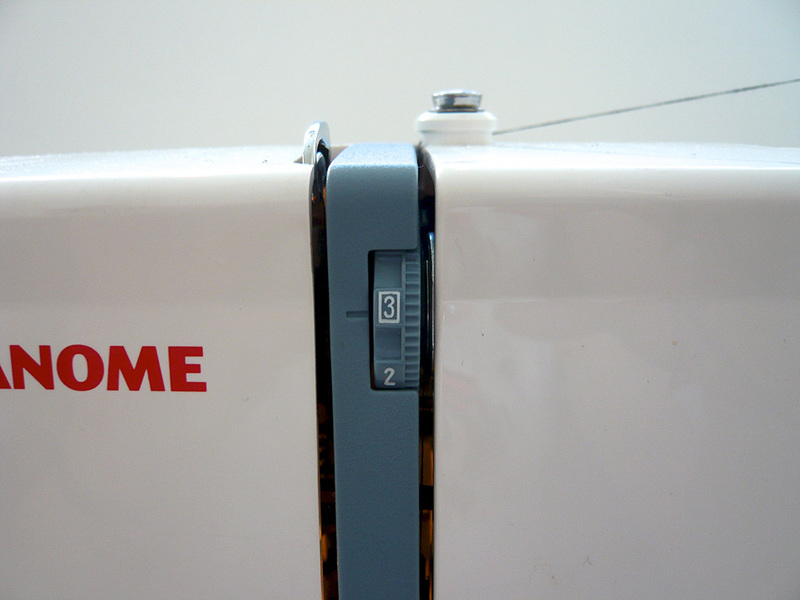 If your machine’s tension dial goes up to 9, 4 should be fine for joining two layers of most medium weight woven fabrics. 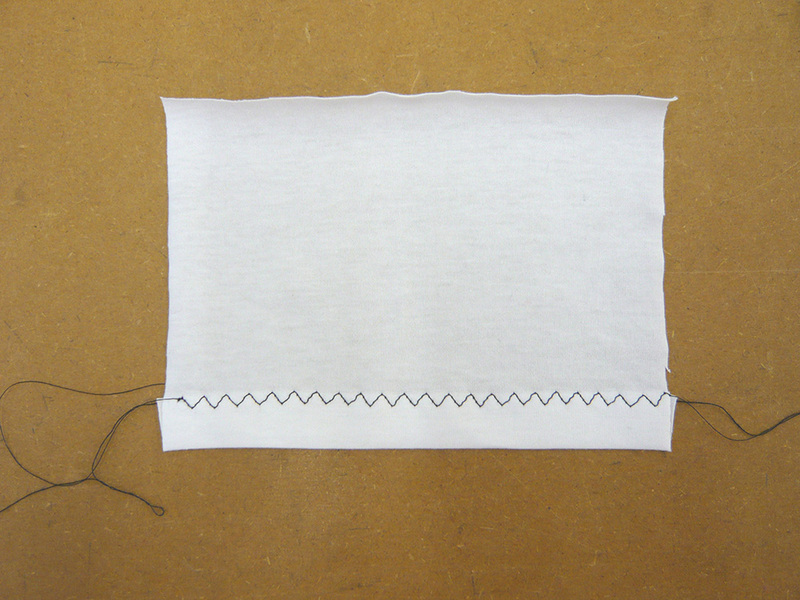 A lower number means a looser stitch which you need for lighter weight fabric or fewer layers. A higher number means a tighter stitch which you need for thicker fabrics or more layers. You shouldn’t need to adjust the tension up or down by more than one number, meaning you will usually stay within the range of 3-5. Most lighter weight knit fabrics eg. t-shirt jersey and lighter need a looser tension of around 3. 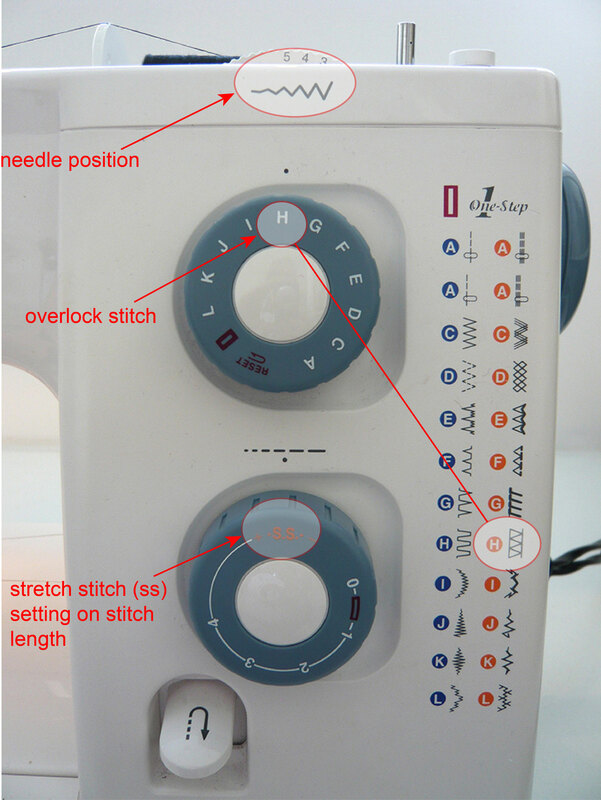 So there you are – how to sew seams in a range of knitted fabrics on your sewing machine. I hope you’re turning from a knit-phobe into a knit-fan! 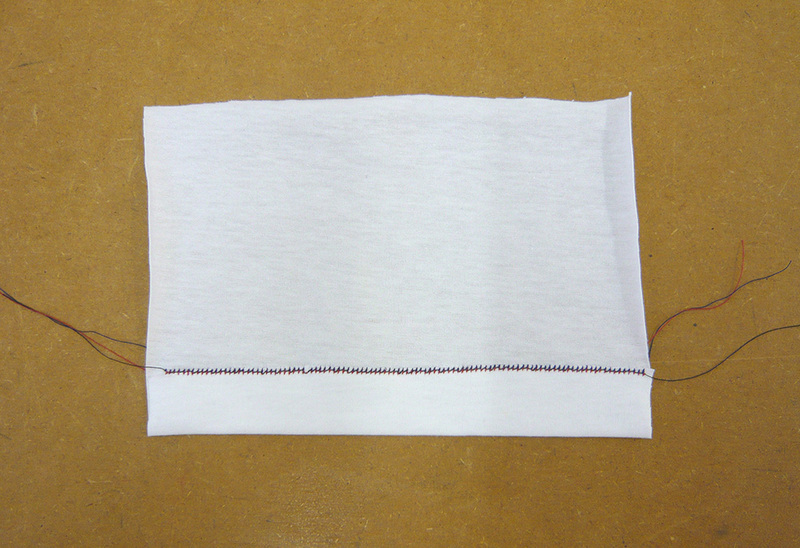 In my next article I’ll show you how to get nice hem finishes on knit fabrics using a sewing machine. 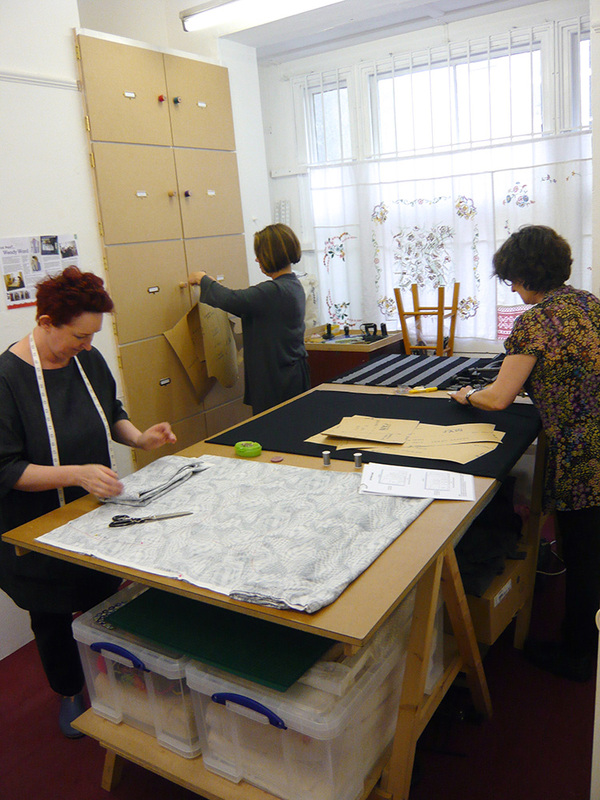 Sunday saw 5 students at another of my popular “Sewing with Knits” workshops. It always amazes me how quickly these days whizz by, especially when I have such a lovely bunch of students. 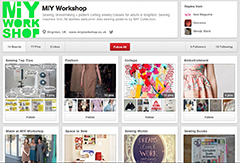 After a little trying on session to choose which of the MIY Collection patterns they were going to make I soon set them to work…. 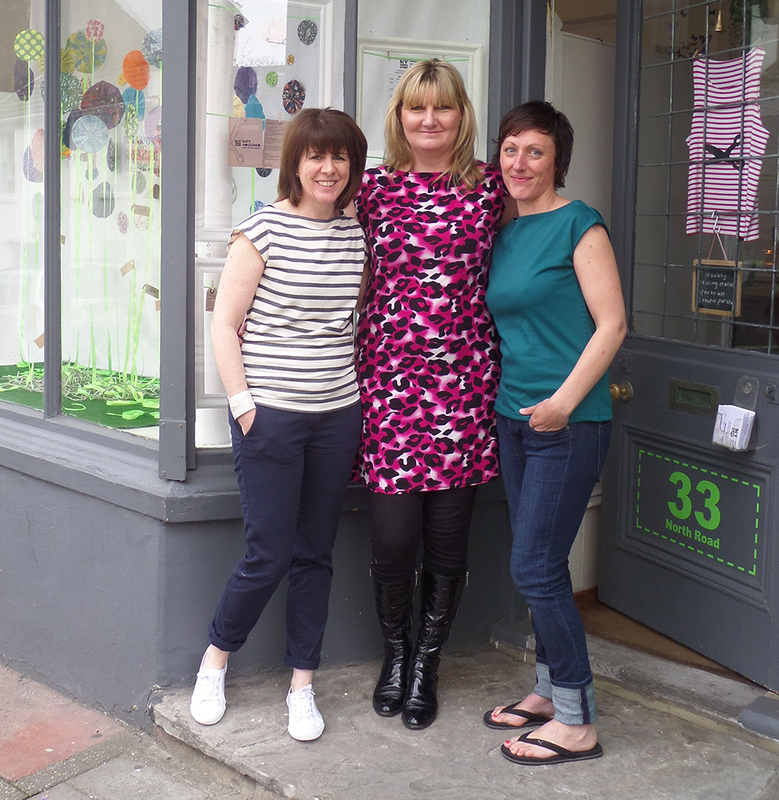 Here’s Joy, Wendy and Lynn who all decided to make the Drapey Cardi, Lynn had the extra task of stripe matching……! Joy runs her own knitting business and has written about her experience of the workshop on her blog: http://theknittinggoddess.wordpress.com/2013/06/17/this-may-make-your-eyes-go-funny/ Thanks Joy and I hope you’re now enjoying wearing your cardi! 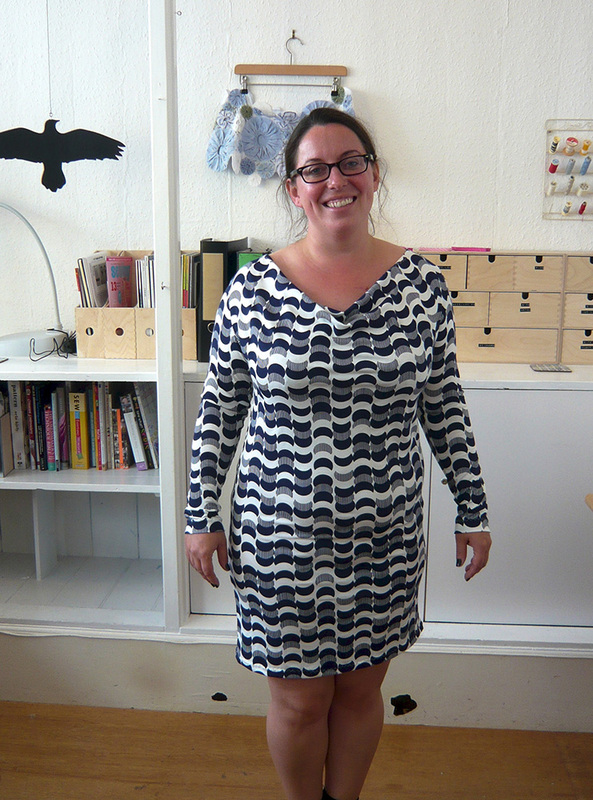 Hèlène chose the straight neck dress and this gorgeous fabric is from online fabric shop Fabric Godmother. 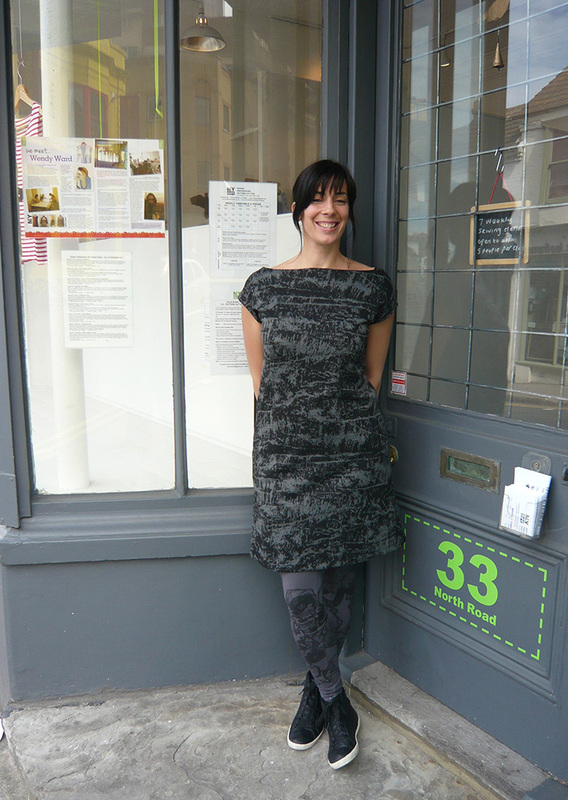 Fiona made this gorgeous cowl neck dress with fabric from John Lewis. Fiona has only recently started sewing after coming to one of my Skirt Making workshops so I was extra impressed by what a good job she made of this! I’m still in the process of putting together the instructions for this pattern, but it will soon be available to buy. All 3 cardis were also tantalisingly close to being finished by the end of the day and the 3 students making them went home confidently knowing what to do to get them finished. A picture of Joy’s finished one is on her blog post. 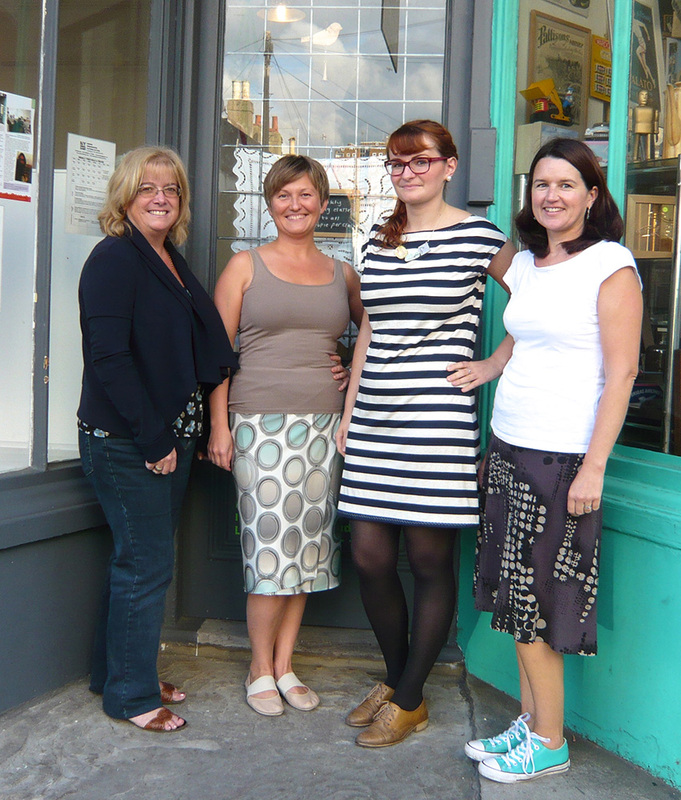 The next Sewing with Knits workshop is on Sunday 6th October. More details here.